Swarms of firefighting drones could one day be deployed to tackle hugely destructive megafires that are becoming increasingly frequent in the Mediterranean region because of climate change, arson and poor landscape management. It’s one of a number of initiatives looking at how best to fight large fires from the air – a challenge that’s becoming more and more common. A 2017 report on forest fires by the EU’s Joint Research Centre said that the year would ‘likely be remembered as one of the most devastating wildfire seasons in Europe since records began’, after the destruction of nearly 700,000 hectares of land in the EU by early September. Such fires are dangerous not only for people who live in the area but also for the crews of people whose job it is to put the fires out. But using intelligent robots to scout the area and drop water can allow humans to stand further back from the danger zone, only looking at the drones’ data to make decisions from the safety of a command and control centre. Because drones can fly day or night and gain rapid access to previously inaccessible urban or rural fires they can help to save both the lives of the public and first responders. 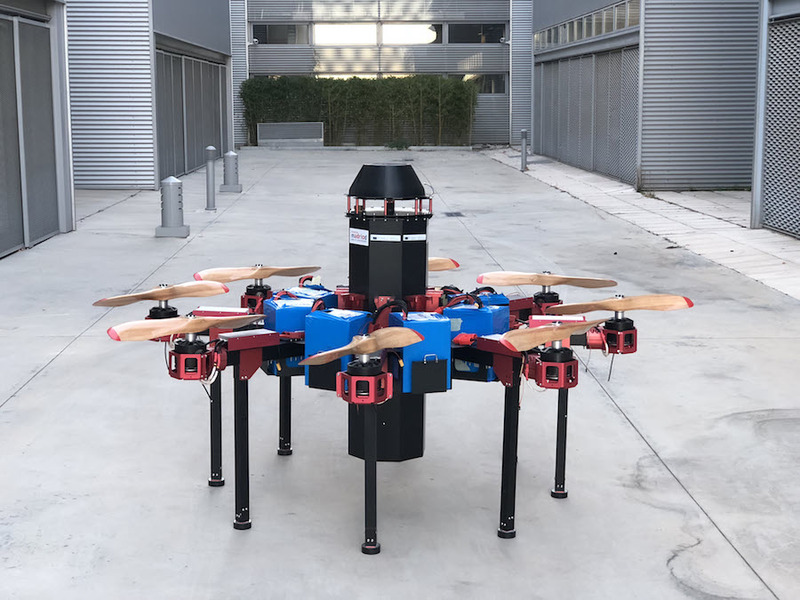 Multiple autonomous drones dropping 600 litres of water every minute during the night while other unmanned vehicles refill to repeat the attack on a raging fire is the vision of Spanish company Drone Hopper. Despite this torrential approach, ‘we are not meant to be competitors with the airplanes and helicopters, we want to be complementary,’ Drone Hopper’s chief executive officer, Pablo Flores, said. Their drone uses heat cameras to locate the fire, analyse it, send back the data, and identify what type of fire it is. At just over a metre and a half in length, it can be deployed from an aircraft, as well as a ground vehicle. The drone is like a helicopter and can hover directly over a specific burning area, but it has many propellers. Once over its target it will release its liquid cargo as a mist designed specifically for the fire type identified. A mist is good at fighting fire because it cools the area by evaporation and it blocks the transfer of heat to anything flammable nearby. To create the right type of mist, the Drone Hopper uses a proprietary magnetic system and the jet wash from its many propellers to direct the released water and nebulise it. Flores wants to offer his drone, which is still in development, to local authorities for firefighting. ‘They can’t buy a $30 million airplane, but can have this platform and have their own means to (tackle a fire).’ He says that the Drone Hopper UAV costs five times less per litre than a water tanker aircraft. But, there is a regulatory obstacle. At the moment, it hasn’t been proven that drones can reliably act autonomously, so national rules generally require each one to have a human remote pilot. He is developing a way of coordinating drones that he hopes could contribute to a change in regulation. By the end of the year, Dr Ure expects to be field testing autonomous drones and their swarming algorithms, developed under the DUF project. Like Drone Hopper, ‘we are detecting the fire by using vision,’ Dr Ure explained. In initial testing the image processing will not be done by the drones, but eventually in real-world flight-testing the algorithms will be installed onboard. His drones would fly over a burning area and, by examining the vegetation and wind direction and other factors, predict the fire’s spread and direction. With that information they would then precisely drop retardant to stop the fire. Dr Ure added that further flight-testing may see cooperation with the Turkish government’s Ministry of Forestry and involve a controlled fire. However, there is work yet to be done to improve the computer-generated fire images in the simulated environment they are using for training the artificial intelligence. ‘Our models are, in the graphical parts, not state-of-the-art,’ said Dr Ure. He wants to have ‘hyper-realistic’ fire for the drones’ vision analysis software to learn from. For him, that will help ensure the drones will operate well in the real world. And in the real world, Dr Ure sees many other applications. ‘I would like to extend this algorithm to other scenarios such as search and rescue and planetary exploration,’ he said. Ground fires occur 25 to 50 cm underground and move slowly, burning through peat and roots. They are notoriously difficult to put out and, if the conditions are right, they can smoulder through the winter and then move above ground in spring. Surface fires move at a speed of between 3 and 300 metres per minute but burn only the lower vegetation and leave the trees unaffected. Of all the fires, they cause the least damage and are usually easy to put out. Ladder fires climb up the taller trees and engulf smaller vegetation. Vines and invasive plants help the fire gain momentum. Crown fires burn trees all the way to the canopy and are the hottest and most dangerous of wildfires. They can spread quickly and are very difficult to put out, partly due to the height of the flames. 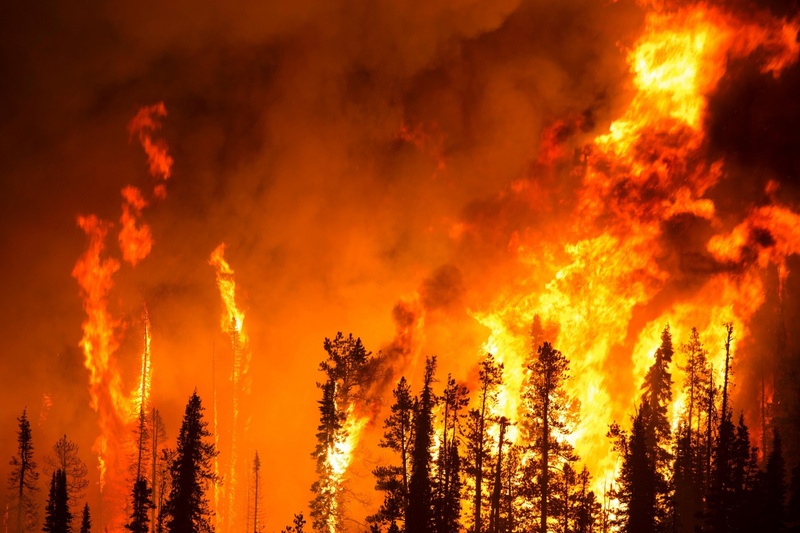 They can spread beyond natural firebreaks such as rivers through a process called spotting, where wind or hot air carries a piece of burning wood elsewhere and starts a new fire. The research in this article is funded by the EU. If you liked this article, please consider sharing it on social media.